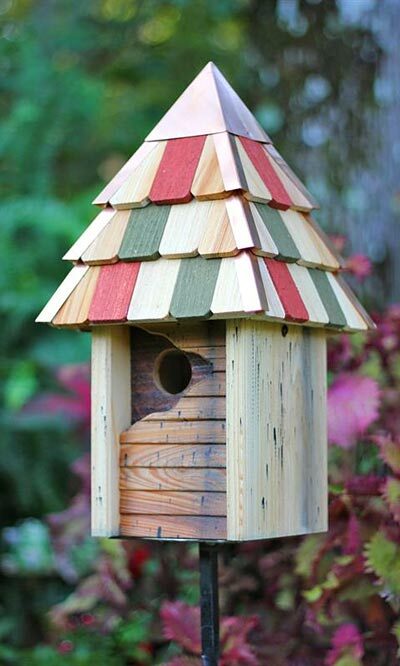 Draw a wealth of visitors to your bird garden with the Heartwood Vintage Gatehouse Bird House. The artistic details, bold colors, and functional design combine on this home for a remarkable bird shelter. Three sides of the rectangular roost have a nature inspired, mottled look, while the front side has beadboard siding. The 1.25" diameter entrance hole rests on the side of this panel, inset in a triangular cut out. This recessed look mimics openings found in trees in nature, and the cut out adds a bit of rustic style. A tall roof covers the home, with multicolored green, red, and tan shakes on it for further interest. A copper cap at the pinnacle of the roof, as well as copper flashing on its sides, brings color and modern elements to the item. Ventilation slots beneath the roof overhang help regulate the internal temperature of the home, and a gap on the base allows any water to drain. The home can be checked regularly by removing the copper panel on the back. Attach a 5.5" x 4.5" or smaller mounting plate (not included) to the base of this home, to easily mount it on a pole or post. Add drama to your bird garden with this Vintage Gatehouse Bird House. Made in the USA.